When you score Brain Rewiring, you may pay Xcredit to force the Runner to add X cards from his or her grip to the bottom of his or her stack at random then draw 1 card. The black level clearance sub-sub-basement of Haas-Bioroid is a magical place. What is randomized by Brain Rewiring? Which cards are selected from the grip, or the order they are put on the bottom of the stack? Cards in grip are the runner's "life points". Brain rewiring lets you bring the runner down to 1 card in grip for at most (barring grip extenders like Public Sympathy) 5. Now if you're like me you're thinking of ways to deal two damage to the runner to flatline them. Unfortunately it's generally difficult to actively do damage to the runner, It requires the runner to either be tagged (Scorched Earth, BOOM! ), get tagged (Mr. Stone) or have stolen an agenda (Punitive Counterstrike. 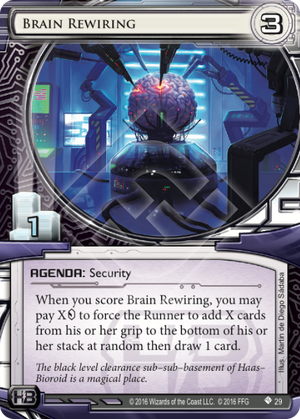 Even more far fetched is scoring two agenda's in one turn with the first being Brain Rewiring, the second being NEXT Wave 2 and having Sentinel Defense Program already scored. Another, less direct, way of thinking about Brain Rewiring is as a scoring window generator. At the very least the runner will want to draw a few cards if they even suspect they could run into something that deals damage. Combined with click destruction like the upcoming MCA Austerity Policy it could be enough to deter the runner from running your server while you're pumping out a 5/3. Making the runner lose 5 cards to the bottom of the stack could in and on itself be a major tempo loss as well. Especially if the runner is low on economy things like vital icebreakers tend to accumulate in their grip. Forcing those out of sight should delay them enough to be able to advance your game plan without having to worry too much about pesky intruders on your servers. Because of the significant cost of using Brain Rewiring for its effect it's best to only include it if you either have a deck with a significant amount of damage (to scare off or kill the runner) or if you are sure you can make use of the scoring window it can provide to gain more agenda points.